Milburgha (or Mildburh) of Wenlock was the daughter of Merwald (or Merewalh), a minor king in Mercia, one of the seven kingdoms in Anglo-Saxon Britain, and of his wife, "Domina Aebbe" (Lady Aebbe)--according to legend, Queen Aebbe was the granddaughter of Eadbald, king of Kent from 616 to 640. Milburga's mother was one of three sisters who became saints--she is most frequently referred to as St. Ermenburga, although this seems to be the name of her sister . . . The three sisters--Milburga's mother and two aunts--are St. Ermenburga (more properly St. Aebbe), perhaps the founder of a double Benedictine abbey in Thanet;* St. Ermengitha, who served as a nun in the abbey at Thanet; and St. Etheldreda of Kent (there's another, earlier and much better known St. Etheldreda as well, but she's not this one). 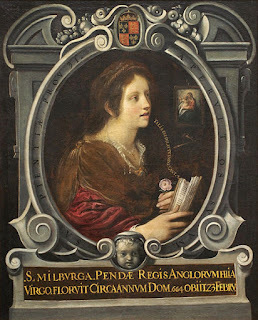 As for Milburga, she was also one of three sisters, the eldest of the daughters born to Merwald and Aebbe--like her mother and her two sisters, Milburga and her two sisters were dedicated to the religious life, and all three became saints. As her story goes, Milburgha was much sought after as a wife by a neighboring prince--and he refused to take no for an answer. Resorting to violence, he attempted to take the young woman by force, but she fled from him and his invading army. She managed to cross a river, and her pursuer was foiled when the river became impassable. After her fortunate escape, she seems to have been in France, where she was educated at Chelles Abbey, a Benedictine double monastery near Paris. The convent flourished under Milburgha, not least because of her remarkable power over birds--she could keep them from damaging crops. Noted for her humility, Milburgha was also credited with restoring sight to the blind and with the gift of healing. Milburgha died on 23 February 715. 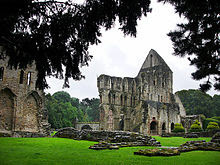 Milburgha's Wenlock was destroyed by the Danes, but the site was rebuilt in the twelfth century by Cluniac monks, who also believed that they had located Milburgha's bones--they established their rebuilt monastery as a pilgrimage site. of Milburgha's Wenlock, destroyed by the Danes. As for Milburgha's sisters: Saint Mildred (or Mildred) became abbess of Thanet, her mother's abbey, while Saint Mildgith seems to have first entered the religious life in a monastery in Kent before succeeding Mildred as abbess of Thanet. comprising communities of both men and women, dwelling in contiguous establishments, united under the rule of one superior, and using one church in common for their liturgical offices. The reason for such an arrangement was that the spiritual needs of the nuns might be attended to by the priests of the male community, who were associated with them more closely than would have been possible in the case of entirely separate and independent monasteries. This form of monastic foundation was frequently seen in Anglo-Saxon England, where the institutions of monks and nuns were governed by abbesses, such as the renowned Hilda of Whitby.